Barrett Adventures Ocho RIos - Barrett Adventures the Real Jamaican Adventures. Description: The Secret Falls are probably our single most popular tour. We have lots of unknown waterfalls around the island, but this one is the most accessible. Thrill to a day spent jumping off of cliffs, basking in the sun and hiking up the falls for a real adventure without the crowds associated with our more well known neighbouring falls. The incredibly blue waters will knock your eyes out. After you have spent all the time you wish at the falls, we take you tubing on a lower part of the same river. Exciting rapids, but not difficult. All ages can go. Perfect family day in Jamaica. Description: If you can't come to Jamaica and NOT climb Dunn's Falls, allow me to suggest the best way to do it. There are an average of 3000 people per day on Dunn's, holding hands in long lines who won't let you cut through them at all. We have started taking our guests early, so we arrive at the falls at 8:30AM just as the ticket booth opens. We run to the bottom and climb the falls taking pictures of us being the only ones on the falls. Then we sit at the top and watch the hoards start to come up after us. At that point, we go off to the Secret Falls which we have almost to ourselves for the whole day. Fifteen minutes above the village of Priory is one of the best kept secrets in Jamaica. The day we discovered this zip line two of my drivers and I showed up there unannounced and the owner couldn't believe we had found him.....hehe. I immediately knew that it was sufficiently 'off the beaten path' for our purposes and went in for a guided tour of the place. It is amazing.... totally unlike the tourist zip lines that dot the country, this one caters to a large number of locals. A great cultural mix for your adventure in Jamaica. It has four zip lines, two of them very long (1100-1400 feet) plus a completely novel swing called the SCREAMER. I took my favorite annually returning blind couple (who are the most amazing adventurers you will ever meet) and we had an AWESOME day there. Description: So many guests have wanted a zip line with the Secret Falls. We can now offer this combination. Our driver, Shawn, discovered this zip line in the hills above Priory and dragged me over to see it. 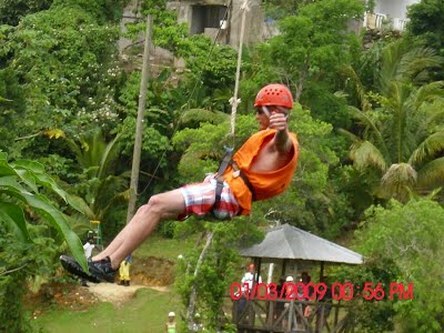 It is completely different from any other zip line and incredible family fun. The first stage of five zips starts at the top of the tower in the picture at left. From there the fun continues unabated with four close to 1000 foot (325 meter) long zips and the SCREAMER. To see more on page two. Click on the link below. GREEN GROTTO AND THE ULTIMATE JERK CENTRE Barrett Adventures. The GREEN GROTTO is part of the "runaway cave system" used by escaping slaves in the early 1800's. There is a lake 120 feet underground. Right across the street is a one of the better places to get authentic jerk chicken or pork. It also offers a wide menu for those who want to try other real Jamaican food. CRANBROOK FLOWER FOREST Barrett Adventures. Your guide will share with you his knowledge of our bird species and show off a multitude of fruits, flowers and our wide variety of orchids. NINE MILE-BOB MARLEY BIRTH PLACE Barrett Adventures. Description: A pretty drive into the mountains above Ocho Rios and a good opportunity to see how the average Jamaican lives in small villages, surrounded by fabulous mountains. The tour of Bob's early home life is fun. A dreadlocked Rastafarian will show you around the property and tell you how Bob got his start, show you where Bunny Wailer lived across the street and show you a bit of the documentary of Bob's life and death. COCKPIT COUNTRY CAVING ADVENTURE Barrett Adventures. Description: If you would like an adventure suspiciously akin to something out of INDIANA JONES AND THE TEMPLE OF DOOM, this is the trip for you! Spend a day or two (a home stay with some delightful residents of Albert Town can be arranged), exploring some of the most unspoiled, eco-tour territory in Jamaica. Description: Just ten miles past Ocho Rios is the former home and burial place of the world famous playwright, actor and entertainer, NOEL COWARD. Just the view is more than worth the trip, but it is also fascinating to realize how familiar Noel's plays and hundreds of songs are popular even today. Dunns falls tours, mystic mountain and Barrett Adventures. This tour is charged on an hourly basis for transportation only. You can mix and match as you want. Make up the day as you go along.